« Episode 18 of At-The-Helm (My Life in Sound)…. It’s an all soloÂ deal with me on drum machine,synthesizer, vocals andÂ loopsÂ . This is a rare (no-guitar)Â episodeÂ in the series. The first 2 tracks are from October’94, the last 4 were recorded between 6-19 and 7-4 in 1994. Track #6 is dedicated to my father. Performed and recorded live to tape by Bryan Helm. All rights reserved by the artist. 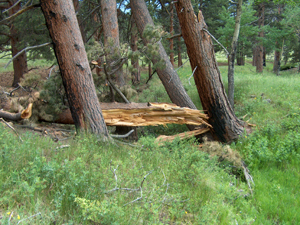 Photo of tree downed by lightning in RMNP Colorado (probably did make a sound).